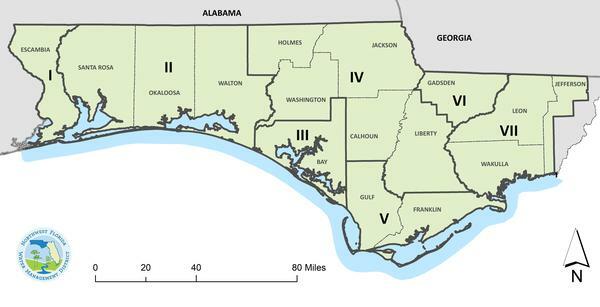 The Northwest Florida Water Management District is divided into seven Water Supply Planning Regions. In 1998, the District completed its first Water Supply Assessment to evaluate the sufficiency of water resources to meet projected demands over a 20-year planning horizon. Every five years, the District updates the Water Supply Assessment to evaluate whether existing and anticipated water sources are sufficient to meet future demands while sustaining water resources and associated natural systems. If the District determines that a region's water needs are likely to exceed available water sources in the next 20 years, the District will prepare a Regional Water Supply Plan, which identifies alternatives for meeting the anticipated future water needs (as required by section 373.709, F.S.). As part of the Northwest Florida Water Management District’s work to ensure adequate and sustainable water supplies are available to meet future needs while protecting the environment, the District prepares regional water supply plans per the provisions of Chapter 373, Florida Statutes. As required by Florida law (section 373.036, Florida Statutes), the District conducts Water Supply Assessments (WSAs) to provide a regional evaluation of water supply sources and projections of future demands for the 16 counties of northwest Florida. For more information on Water Supply Assessments, click here. Every five years, the District updates the WSA to evaluate whether existing and anticipated water sources are sufficient to meet future demands while sustaining water resources and associated natural systems. If the District determines that a region's water needs are likely to exceed available water sources in the next 20 years, the District will prepare a Regional Water Supply Plan (RWSP), which identifies alternatives for meeting the anticipated future water needs (as required by section 373.709, F.S.). For more information on Regional Water Supply Planning, click here. When a RWSP is adopted or updated, local governments located within a Regional Water Supply Plan area have additional water supply planning requirements for their comprehensive plans. For more information on these requirements, please visit the Department of Economic Opportunity.